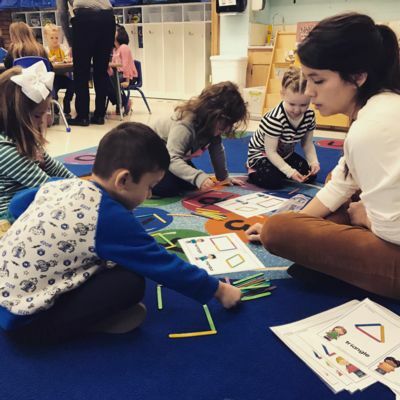 The Topeka Collegiate Early Childhood Program is for children from preschool (age four) through Kindergarten. 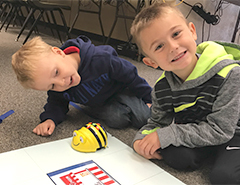 Topeka Collegiate Preschool packs the year with hands-on learning and theme-based adventures to ensure a positive first school experience. Whether we’re practicing pre-reading skills with animal actions (“Zoo-Phonics”) or learning math concepts, our strategies are challenging and fresh. 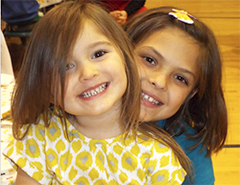 We teach academic skills and positive social behavior through song, movement and stories. As further enrichment, students attend weekly classes in Spanish, art, library, science, music and physical education. Our commitment to experiential learning often takes us outside the classroom. You’ll find our youngest scholars exploring fire trucks during Community Helpers Week or riding their bikes on the playground during Wheels Day. We end the year with a trip to the Topeka Zoo when we deliver the donations we collect during our community service project. Other special traditions include Dr. Seuss Week, Math Olympics, Field Day, Day of the Child, and, perhaps most importantly, our class assembly. Each year, our class works extremely hard to prepare an assembly for parents and the school community. These special productions provide students with an opportunity to perform and to serve as positive audience members for their peers. We appreciate each child, their unique learning styles and personalities. That’s why our program provides every student with opportunities to progress and be challenged at his or her level. Building on students’ natural curiosity and a hands-on approach to learning, we dive into weekly cross-curricular themes like ocean life, community helpers, food and nutrition, countries/continents and safety. Students learn the process of math concepts by investigating, discovering, exploring and applying - using whole group, small group and individualized instruction. Our reading program uses phonics, sight words and whole language - which we incorporate into daily writing projects. We teach social studies using our weekly themes. As further enrichment, students attend weekly classes in Spanish, art, library, computer technology, science, music and physical education. We understand that social growth is a critical part of the learning experience. In addition to the many academic experiences, students are also given plenty of free time to use their imagination, build, color and explore with their peers. They have three recesses each day and a short rest/storytime in the afternoon. "They let the children be who they are."